Mas Kagin Tapani: WHY SAVE THE LEATHERBACK TURTLES IN MADANG? the carapace of a Leatherback Turtle at Yamai village beach in 2014. Leatherback Turtle is a key marine flagship species for PNG. It promotes PNG globally and very much so in the region especially in PNG, Indonesia, and the Solomon Islands. It is one of many tourists products that we need to embrace and support local communities whose beaches this gentle giant comes to nests. Killing and eating a critically endangered Leatherback Turtle or its eggs contributes to the decline and demise of this unique gentle giant hence the destruction of our oceans. Efforts are being made in Madang to protect and restore the population of the critically endangered Leatherback Turtles by our organisation. Madang Province is approximately 300 km long and 160 km wide. It has four large offshore islands namely, Manam, Karkar, Bagabag, and Long Islands, and many smaller ones. The province area is about 29,000 square km and has a population of 487,460. (PNG National Statistical Office, 2011). It has 175 languages. (Please refer to the Madang Spatial Planning Document for details on Madang). 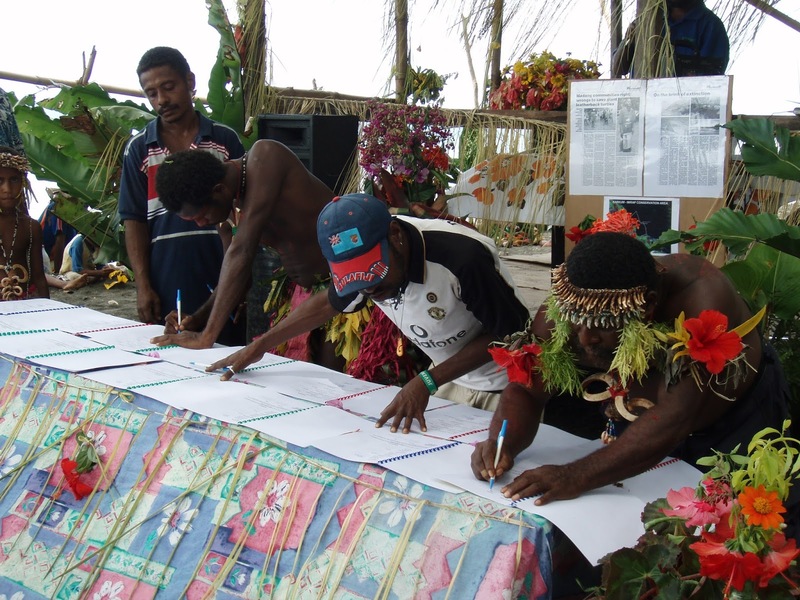 From the 56 protected areas in PNG, 5 are located in Madang. Madang’s Spatial Planning Report indicate that there are however, 40 protected areas altogether in Madang in their different stages of development. MAKATA’s leatherback turtle protected areas come under 40 protected areas in Madang. The world’s oceans are in a state of decline. Populations of sea turtles, sharks and whales are remnant compared to historical accounts of abundance. Fisheries worldwide are also over fished or in states of collapse. Marine turtles have lived in the oceans for a long time. They are an integral part of the traditional culture of many coastal indigenous peoples throughout the world. The decline of Leatherback and other turtles has also affected the food source of locals. It has also threatened their cultural heritage. PNG has been a very fortunate country to be a perfect host of 6 of the 7 species of marine turtle that exist globally. These turtles have been very important link traditionally and culturally for most of the 13 Maritime Provinces. These are specific species of turtles such as the green, hawksbill and the Leatherback Turtles that have very significant traditional importance through spiritual, ceremonial and also medicinal values. Many coastal communities in PNG have these very special relationships with marine turtles and even legends are told to this day. This is true for Karkum, Mur, Yamai, Lalok, Male and Bom-Sagar people based on our baseline studies. They believe they have originated from either the leatherback, green or hawksbill turtles. The Mur people have a ritual which they practise to call the Leatherback Turtles to come so they can kill them and share the protein with inland villagers for taro. In the meantime, Yamai villagers have a traditional song that imitates the leatherback turtle coming to their beach to nest. There are similar folklores in Karkum, Yadigam, Tokain, Lalok, Male, and Bom-Sagar. Marine turtles spend most of their lives at sea, but must return to land to lay their eggs. Turtles are often highly migratory – nesting beaches may be up to 6,000 miles from their feeding grounds. The waters and beaches of the Western Pacific are important nesting beaches, feeding areas and nurseries for leatherbacks, hawksbills, green and loggerhead turtles. Beaches of Indonesia, PNG and Solomon Islands support the largest remaining Western Pacific Leatherback Turtle populations. Leatherback Turtles are globally and regionally important shared species as indicated by satellite tracking data showing migration routes through these countries and on their way to feeding grounds around New Zealand and the United States. Green turtles have also been tracked from the Solomon Islands to Australia and PNG. Key nesting areas for leatherbacks in PNG include Huon coast, which is situated very close to Lae, a industrial city in Morobe, with sporadic sites in Madang, New Britain and Bougainville. Leatherbacks that nest on these beaches migrate as far as the West Coast of the United States, 6,000 miles away, to forage for jellyfish. These turtles are important culturally, economically and nutritionally for the peoples of the Pacific and Indonesia, however they are threatened from natural and human impacts and some species like the Western Pacific leatherbacks are on the verge of extinction. All marine turtle species are experiencing serious threats to their survival. The main threats are pollution. The Western Pacific leatherback's population has declined more than 90% in the past 20 years due to industrial fishing on the high seas and the harvesting of nesting adults and eggs on beaches. The disposal of human waste and other pollutants such as plastic bags pose a very serious threat to the nesting females. The other sources of pollution include land-based pollution from major agricultural developments which use chemicals. This are then washed into the river and this also cause major disturbance to the water temperatures. These changes affect important turtle habitats, especially coral reefs, sea grass beds, mangrove forests and nesting beaches. Other threats include accidental drowning in fishing gear, over-harvesting to turtles and eggs, and predation of eggs and hatchlings by dogs, feral pigs, and goannas. In PNG the over-harvesting of turtle eggs was never an issue to compare with source of food with other added reasons. However, this has changed in the 20 years were eggs have been sold at the local markets in town and cities. The need for income generation has forced a lot of communities to divert their traditional value for the uses of turtle egg from traditional harvested and managed to uses for sale at the local markets. There are only a few large nesting population of the critically endangered leatherback turtles, green, hawksbill and loggerhead turtles left in the world, and in PNG we have only a few major nesting sites to conserve for the future generation. To save the Pacific leatherback from extinction they must be protected where they nest, migrate and forage, and Papua New Guinea’s nesting beaches and coastal waters are an essential part of this conservation puzzle. Saving Leatherback Turtles moreover, fulfils the PNG Constitution’s (1974): Goal 4 – We declare our natural resources and environment to be conserved – wisely used and replenished for the benefit of future generations. The government has also enacted laws to protect the Leatherback Turtle. The Leatherback Turtle is currently the only sea turtle in PNG that is listed as protected fauna under the Fauna (Protection and Control) Act 1966 (Kula and George, 1996). This stipulates that any person who knowingly buys, sells offers or consigns for sale, or has in possession or control of a protected animal is guilty of an offence and the penalty is K500. Any person who takes (kills) a protected animal, in contravention of a condition of a permit is guilty of an offence and the penalty is K40/animal. 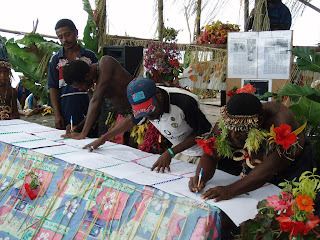 Currently PNG’s government policy and regulation with regard to management of marine resources in PNG waters, do not seem to be successfully implemented, and sustainably managed leaving the rich coastline that indigenous communities rely on for sustenance open to exploitation by domestic and foreign interests. The traditional direct and uncontrolled harvest of nesting adults and eggs is one of the main issues of concern. Due to the wide-ranging threats to the survival of leatherbacks, this practice is no longer sustainable. In Madang Province, a number of communities have traditionally opportunistically killed nesting females and harvested eggs from the nests for sustenance. There were no organized sea turtle protection efforts in Madang prior to STRP’s setting up a project there. The Leatherback Turtles that travel for 6,000 miles across the Pacific Ocean from California all the way to PNG since the era of dinosaurs, weighing about 300 kilograms and can grow to two meters are now at the brink of extinction. Their population has plummeted so much so that it is estimated in 1982 that only 11,500 adult female leatherbacks existed worldwide. In the Pacific the nesting leatherbacks have declined in an alarming rate (95%) and if nothing is done these special turtles will soon be another extinct creature in the next 5 to 30 years. In fact WWF reports show that as few as 2,300 adult female leatherbacks now remain, making the Pacific leatherback the world’s most endangered marine turtle. Who is responsible for all these damages? We all are. But it’s not too late to make a change to save our oceans. By saving sea turtles we can help save the entire ocean because we know that turtles are a keystone species, or a critical component of the marine environment. We know that if we do not save a keystone species, its entire ecosystem processes may collapse around it. The Leatherback Turtles have existed for 100 million years from the era of the dinosaurs. Studies show that they are now at the brink of extinction and are on the International Union for Conservation Networks Red List as one of the 5 critically endangered species. Prior to the inception of MAKATA’s work in Madang, efforts to protect sea turtles in the country were best exemplified by activities in Morobe Province. The Western Pacific Fisheries Management Council, a U.S. body that regulates industrial fishing in the waters near Hawai’i, had funded and trained youth to monitor and protect leatherback sea turtle eggs. A beach access fee is also paid to the communities. This approach has resulted in conflicts within the community about the money, conservation values that are tied to outside funding, and a turtle-only mandate for conservation. Ironically, this U.S. fisheries management council, which is urging villagers to protect leatherbacks on their beaches, is permitting Hawaiian longliners to kill leatherbacks. Our approach is different: sea turtles are a vehicle to address larger marine conservation and community livelihood issues. For example in communities in which we conducted initial assessments, villagers raised concerns about declining fish stocks, increased industrial fishing activities, the impacts of a proposed sea bed mining, sea tailings disposal from mining activities, large scale industrial fishing zones and the impacts of a industrial port. They also raised concerns about their other basic needs, such as neglected medical aid stations, poor water quality supply, lack of library books, and finding markets for organic cocoa, vanilla, cava and other spice crops. Through our approach, all of these factors tie into the protection of sea turtles. Our long-term approach is different as well. We do not want to set up a precedent where communities only participate in marine conservation activities when provided funds from outside sources. Our goal is for the local owners of the resources to be the long-term guardians and stewards of their natural resources and benefit from it. Our trainings have provided them with increased capacity to achieve these outcomes. The critical status of the existense and survival of the Leatherback turtle has seen Indonesia, PNG and the Solomon Islands sign a Memorandum of Understanding to conserve it. The PNG, Indonesia and the Solomon Islands have signed a Memorandum of Understanding (MoU) to effect the call by IUCN to save the critically endangered leatherback turtle in the Western Pacific. They reached the agreement in a workshop of the 3rd Meeting of Tri-National Partnership to the Conservation and Management of Leatherback Turtles in Jimbara, Bali on August 28-30, 2006. The CTI-CFF is a multilateral partnership between the governments of Indonesia, Malaysia, Papua New Guinea, Philippines, Solomon Islands and Timor-Leste. At the Leader’s Summit in 2009, these governments agreed to adopt a 10-year CTI Regional Plan of Action (RPOA) to safeguard the region’s marine and coastal biological resources. The RPOA has five goals: strengthening the management of seascapes; promoting an ecosystem approach to fisheries management; establishing and improving effective management of marine protected areas; improving coastal community resilience to climate change; and protecting threatened species. The State has further documented the status of the Leatherback turtle efforts in its Coral Triangle Initiative’s report under Goal 5’s Threatened Species, where it has acknowledged MAKATA’s efforts. Saving Leatherback Turtles and restoring its population not only protects indigenous cultural heritage and protein. It has also greatly contributed to the local and national economies through tourism and other social and infrastructure support services. This is quite evident for the Karkum Villagers who admitted they had made more than K30,000.00 in 2009 alone from local and international tourists including staff and students from the Madang Teachers College who visit their community for their environmental studies. The bill board erected at the entrance of Karkum village was from funds received from a group of National Alliance of Indigenous Land and Sea Managers (NAILSMA), in Australia who visited Karkum and spent a couple of days sharing their experiences with them. Just visit Karkum village and listen to their exciting stories of how the leatherback turtle program has impacted their lives and what benefits they have received from it since its establishment. They also received funding assistance from the former Australian High Commission to PNG, Ian Kemish in 2010. Mr. Kemish and his delegation visited Karkum to observe how money used from the Australian High Commission Head of Mission Direct Aid Programme (HOMDAP) funding was used to build Karkum’s community hall for their efforts to save the leatherback turtles. Article on this story was published on Monday, 12 April in The National newspaper, page 11. MAKATA had also donated computer and accessories, library books, and other resources to Karkum since the establishment of this project with support from WWF, Buk Bilong Pikinini and World Bank. Efforts to save, and restore the population of the Leatherback Turtles have led us to assist local communities establish their community resource management plan. It evolved into a holistic marine conservation effort where villagers are assisted to sustainably use their natural resources using an adaptive marine resource management plan. Threats to the Leatherback Turtles have also instigated us to address other potential threats in Madang province. We have raised concerns on the experimental sea bed mining, Pacific Marine Industrial Zone, and tailings into the sea from Ramu-Nickel and Cobalt mine and other industrial activities. To summarize, establishing “protected” areas helps save leatherback turtles. It can be the basis of sustainable livelihoods for the customary landowners, through supported local adaptive resource management or land use planning which sets out and protects the landowners’ agreed areas for food production; access to forest, grassland, freshwater and marine resources; and conservation areas. Protected areas keep options open for future generations, by conserving samples of the landscapes and seascapes with their plants, animals and cultural stories intact. Once these places are lost or degraded it is very difficult and expensive – or impossible – to fully restore them. It is therefore very crucial and significant that urgent steps are taken to save Leatherback Turtles by enabling communities to establish their respective adaptive resource management plans. This will help save the critically endangered Leatherback Turtles from going into extinct in this 21st century. Damage caused once can remain irreversible. If you apply this same analogy of leatherback turtle to coral reefs or any other flora and fauna, you will get the same sad scenario. We therefore have a job to do to save the critically endangered Leatherback Turtles and help communities establish their adaptive resource management plans. Any funding support to MAKATA, in-kind donation, library books, computers for communities and schools in our project sites will be most appreciated.